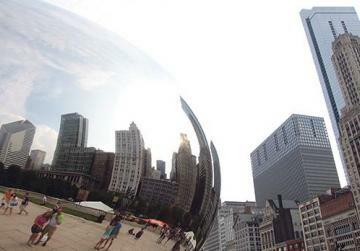 The ‘Bean’ sculpture in Millenium Park, Chicago. Although my knowledge only spanned as far as the Chicago Bulls and blues music, I’ve always had a keen interest in the city of Chicago, and to say I was extremely excited to visit would be an understatement. This city surely didn’t disappoint. 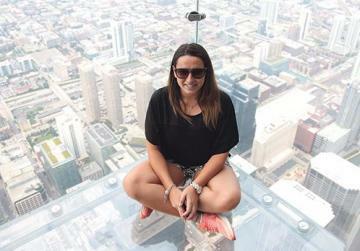 Chanel, the author, sitting on SkyLedge, a glass box extending outwards from the main structure of Willis Tower. After a five-hour drive from our previous location, we finally arrived in ‘Chi-Town’. Once we settled into our hostel, we joined up in the communal lounge for a late lunch. Being in Chicago, we had to try out the city’s famous deep-dish pizza. Differing from the classic Italian-style pizza I was used to, this was thick-crusted, with the melted, stringy, cheesy goodness sandwiched between the pizza base and the upper tomato sauce layer. This was a good first meal in preparation for the rest of the evening. Loaded up with carbohydrates, we took off on a night bike tour of the city. Being a hesitant cyclist, I was anxious to ride with a big group in traffic, so I stayed towards the back end. Rounding sharp corners was a difficulty, as I couldn’t brake and turn at the same time. Indicating was not an option, unable to let go of the handlebars. Despite these many challenges, some good people stayed behind with me and, by some miracle, I managed the tour. We cycled into the Jane Addams Memorial Park, as we stopped to have a look at the city’s Centennial Ferris Wheel and listened to some historical information about it. 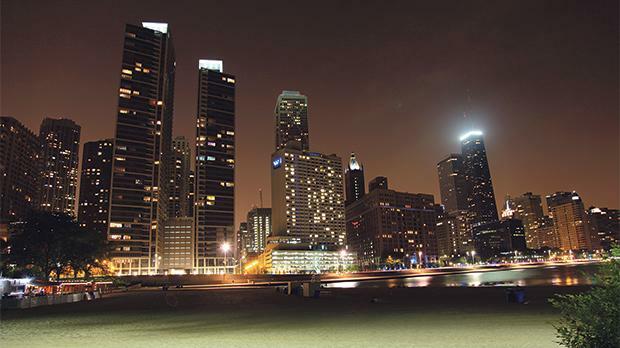 We caught a glimpse of the beautiful illuminated skyline and continued to cycle along a lakefront trail that ran parallel to the city. The scenic view distracted me from my awful cycling skills and I began to relax. 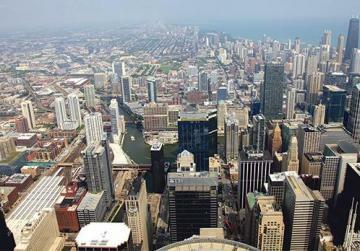 Diving into the city, we crossed the Chicago River over the DuSable Bridge. The golden lights from the surrounding towers reflected onto the river, the ripples given off by passing boats making the lights blink and shimmer. Pedalling further, we cycled into the popular Millenium Park. Modern sculptures were lit up in varying colours, enhancing their beauty even more. We came across the ‘Bean’ sculpture, something I had been looking forward to viewing in the city, which wasn’t too impressive during the evening. We rested our legs and caught our breath as we viewed the tiered Buckingham fountain, lit up elegantly and spraying water in all sorts of directions, creating a sort of Zen-like feeling. The last stretch before returning the bikes was towards the Adler Planetarium, a peninsula that offered the most breathtaking views of the city’s skyline. It’s always so different seeing a city by night, where everything is calmer and quieter and at peace. Finally free from the bikes, we got ready and headed out for a night of music. Chicago being famous for its blues music, we motioned straight towards ‘Buddy Guy’s Legends’ bar. Any lover of blues would know of Buddy Guy, so this was definitely the place to be. With nowhere else to be, we let the night slip away as we mellowed down to some excellent live blues. The next day, we took to the streets of Chicago. During the day, we could enjoy the city’s beauty much more as we explored the top spots. We started off by visiting Willis Tower, the tallest skyscraper in the city and the second tallest tower in the US. I felt butterflies in my stomach as we rode the elevator up to the 103rd floor. The grey city seemed like an endless game of Tetris, towers rising above and around each other. Enjoying the panoramic views, I stepped onto SkyLedge, a glass box extending outwards from the main structure of the building, and looked down past the glass floor. My knees grew weak as I distinguished the minute, ant-like cars. Looking ahead, I marvelled in my surroundings at the depth of the city and the lake fading into the haze. Back at street level, we passed the time people watching in Millenium Park. 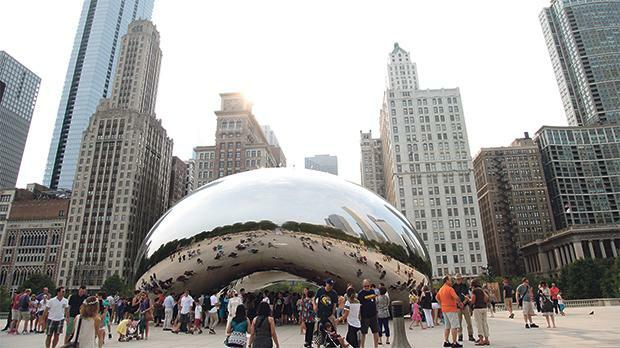 Cloud Gate, which is more commonly known as ‘The Bean’, is a huge mirrored steel sculpture shaped in a bean. Its distorted shape creates an interesting reflection of the surrounding buildings, which is what makes this sculpture so much fun to photograph. It served as the backdrop for hundreds of people who gaped at all angles of this whimsical structure. To finish off the day, we headed towards the Magnificent Mile, a mile-long street lined with shops. Looking up at the John Hancock tower, we ventured towards it and elevated to the 96th floor lounge for a few aperitifs. 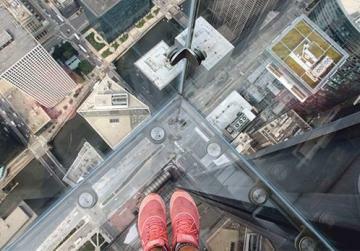 Willis Tower, located towards the edge of the city, offered us a different perspective. From here, we could admire the vastness of Lake Michigan and even view the path we cycled through the night before. With every gust of wind, I grabbed on tightly to my chair as I felt the tower slightly sway. I thought it was just my imagination, but the ice in the drinks clattered and shook and, being sensitive to movement, I felt nauseous. After a few seconds we seemed to stabilise, until it happened again. I looked around and realised I was the only one reacting, the swaying movements apparently normal. I felt more at ease and continued to enjoy the stretch in front of me. We ended our visit with a stroll towards Navy Pier. We got a closer look at the sparkling, hypnotising Ferris Wheel and stepped down towards the beach for the final opportunity to enjoy the city’s flickering lights behind us. My time in this amazing city not only reached my expectations but surpassed them. At the end of a wonderful few days, I felt a sense of fulfillment for having taken in so much of this city. It really is a city like no other and I cannot wait to return to beautiful and bustling Chicago.